From the Editor: When I first came into the Federation and started receiving the Braille Monitor, I read about a battle with an agency called NAC, then the National Accreditation Council for Agencies Serving the Blind and Visually Handicapped. NAC said its goal was to bring standards to work with the blind and to improve the services the blind received, so the question I needed answered was why my newly-found Federation would object. It didn’t take much reading of the correspondence between President Jernigan and officials of NAC to understand why. It was made abundantly clear that the organized blind were not a part of the process; we might be blind, but we weren’t “professionals” in the field and shouldn’t pretend to know the first thing about quality services. The Federation would articulate a concrete concern, and someone from NAC would respond by saying that as consumers we could not be expected to understand the work of this accrediting body, the standards it used, or the reason for those standards; nor did we have the education and experience to make a determination as to whether they had been followed. The Federation was told, sometimes gently and sometimes not, that our error was in presuming to speak to standards and to service. Indeed we were blind, indeed some of us were articulate, indeed some of us had impressive credentials in other fields, but this did not make us qualified to participate in the process of service delivery, let alone accreditation. In NAC’s pronouncements it was clear that, no matter what we might write or say or do, our opinions were not needed or sought. We might parrot the language of the professionals and ape their behavior by dressing well, showing up for meetings, and addressing the press, but the fact was that being blind meant only that we suffered from the condition. We certainly could not know anything about how to serve or take care of those who were blind, let alone administer the agencies that directed their lives. With this reaction to our worthiness as full-fledged human beings whose very opportunities were being influenced by those who would not listen, many of us for the first time decided to do the unthinkable—we would take to the streets and protest. By marching and chanting outside gatherings of NAC, we earned the ire of some who would give us names that did not fit with our mission or self-concept. We were called “radical,” though we did not advocate revolution or even thorough and complete social reform. Our straightforward and eminently reasonable demand was to have some influence over the agencies designed to serve us. Sometimes we were called “militant,” but we were not combative, aggressive, or violent in our call to be heard and recognized. Though the rallying cry “nothing about us without us” had its origins in fifteenth-century Poland and certainly was found in our own country’s revolution when angrily we denounced taxation without representation, the slogan did not gain popularity for people with disabilities until the early 1990s, two decades after the blind demonstrated our commitment to the concept on the streets of many cities in our nation. The National Accreditation Council has been offensive to blind people not just because we were left out in its construction, its standards, and its administration. NAC has let itself be used in ways which have given agencies a free pass when accused of the misuse of agency money or even the abuse of blind people, especially blind children. When the Federation brought legitimate concerns about bad behavior to agency administrators and their governing boards, these were dismissed. When we took those same concerns to the press, they were often published, but the agency’s defense began and ended with the assertion that they were accredited by the National Accreditation Council for Agencies Serving the Blind and Visually Handicapped. These assertions were verified by NAC, and the charges of bad conduct and abuse were never investigated by the so-called accrediting agency. Sometimes the word accreditation was so powerful that in the press coverage, legitimate concerns of consumers finished a distant second to the idea that the people in charge of these agencies were professionals who were being watched over by other professionals. The blind who complained were portrayed as malcontents who just didn’t understand the complexity of service delivery and who seized upon small incidents and tried to turn them into significant issues. Over time our persistence paid off. The American Foundation for the Blind, which had given hundreds of thousands of dollars for the creation and maintenance of NAC, withdrew its funding. The United States Department of Education, which had been persuaded that accreditation would ensure quality education, eventually withdrew its funding and its strong push to have every blindness program in the country accredited by NAC. The number of agencies accredited by NAC fell each year, the best agencies being the first to withdraw, and the worst being those who clung to NAC as their single best defense against accountability and change. For more than two decades NAC has existed in name, but has not been a significant player in the blindness field. Its annual reviews have been self-studies, and we have never known any of its member agencies to be rebuked or removed from the NAC family. Agencies wanting meaningful evaluation have turned to the organizations that represent the consumers they serve and have relied on other accrediting bodies which deal with education and rehabilitation. They have decided that nothing in the annual dues paid to NAC enhances their service and that the satisfaction of their consumers is the real test of quality service and genuine partnership. This is a call to action for the blind of America to ensure that the struggles of our past do not resurface in a manner that impedes our future. As the fourth generation of the Federation has come into leadership, we have brought with us a perspective that has been shaped by our history but has not been significantly influenced by some of the most contentious struggles of our civil rights movement. This is both an advantage and a disadvantage. For the leaders of my generation, we grew up in a time when the National Federation of the Blind was emerging into the position of true leadership in the field of work with the blind. In many situations during the past thirty years, we have worked collaboratively with key professionals in the field to advance issues of significant concern to the blind. In this call to action I will not recount the well-documented history of NAC. However, for those of my generation who did not live through the NAC-tracking period of the Federation and for those who need a reminder, I offer the following excerpts and provide a few references to previous Monitor articles for background. Although my generation of Federationists did not live through the right to organize battles of the 1950s, the use of an accreditation system to protect agencies doing harm to blind people, and active efforts to prevent blind people from being eligible to teach travel, we should not act as though those events are not relevant to who we are today and the dreams we seek for blind people. The history matters, and we the blind are determined to shape the future. It is said that those who do not learn history are doomed to repeat it, but I think Mark Twain’s perspective might be more appropriate: History doesn't repeat itself, but it does rhyme. My personal history with NAC might give you some insight as to how I approached the conversation that appears below. In June 2000, I was appointed to serve as Director of the Wisconsin Center for the Blind and Visually Impaired (a state agency that has responsibility for providing a number of statewide services for children and adults in Wisconsin including operating a residential school). In that position I worked on the accreditations the agency was required to have as a K-12 school operating in the state. In 2002 I learned about the NAC Summit meeting that was planned for Florida in December. As a member of the Council of Schools for the Blind [COSB], I provided my concerns about the failed NAC accreditation program to the individual who would be representing NAC at the summit. As a member of the National Federation of the Blind, I wanted to be with Federation members protesting the meeting itself, but my schedule would not allow me to be away at the time of the meeting in Florida. Therefore, I settled for urging COSB to encourage NAC to close its doors and go out of business—an opinion that was shared at the summit meeting by others as you will find in the February 2003 issue of the Braille Monitor. NAC was never a topic of discussion at any of the conferences I attended related to the education of blind children, so I rarely gave it much thought. In November of 2003 I moved to Maryland to work for the National Federation of the Blind. In 2004 Lou Tutt left the presidency of the Maryland School for the Blind, and I was surprised to learn that the school was accredited by NAC. When a new president was appointed to lead the Maryland School for the Blind (a woman I knew from my time participating in the Council of Schools for the Blind), I approached her about dropping NAC accreditation. I thought I might be able to convince her that the students at the school were not better off because of the NAC accreditation. She decided that the matter required more study even though the National Federation of the Blind of Maryland urged her to drop the useless accreditation. Eventually the Board of Trustees for the Maryland School for the Blind dropped the accreditation and found a new president to administer the programs of the Maryland school. Since that time the Federation and the Maryland School for the Blind have found opportunities to work collaboratively on a number of projects, including a Braille conference in October 2017. NAC was not providing Maryland with any value, and eliminating it saved the school dollars that could be put into programming and improved its ability to partner with blind consumers. Based on my experience, I have always believed that NAC would eventually close its doors when the small number of agencies still paying NAC for the privilege of doing a self-assessment of their services got tired of receiving no value for their dollars. A few short weeks ago we wrapped up an extraordinary AER conference. A conference that served as a valuable educational event for Orientation & Mobility specialists and other professionals in the field; and one that reflected our strong commitment to you as members. Over the last months, we have listened carefully to our members. In addition, we have studied the last few years—examining our operations, member services, and the professional environment in which we work. As a result, the AER Board President appointed a Strategic Planning Team. An analysis was conducted that pinpointed AER's strengths, weaknesses, opportunities, and threats (SWOT). This data served as the framework that drove a process that spanned several weeks and led to the creation of an operational plan to move AER towards elevated excellence by 2020—The AER Strategic Plan 2017-2020. AER deeply and actively cares about the success of its members and those who are served; and provides resources and support to help them exceed their own expectations. AER respects the worth and uniqueness of each individual and embodies a culture where diverse backgrounds, experiences, approaches, and ideas are revered. In addition, we are pleased to announce that effective July 1, 2017, the accreditation program previously managed by the National Accreditation Council for Blind and Low Vision Services is under the executive management of AER. This represents an extraordinary opportunity for AER and the clients who are served by agencies committed to delivering high-quality services. We are working steadfastly to ensure that this change will reflect an even stronger focus on quality and service delivery. Over the next few weeks, we will complete our assessment and make adjustments as necessary to strengthen the overall program. There is a new Accreditation Council that has chief [responsibility] for setting and enforcing the standards. This body will be tactically examining the current program and will make strategic modifications that will result in a guarantee of high merit and excellence in service delivery. Our commitment to you is immediate; and we cannot emphasize strongly enough your value to the field. Our promise is to listen, build on our strengths, make improvements, and work to provide the services and resources that you need. These are extraordinary times at AER; and we sincerely thank you for the life-changing work that you do and for being a part of AER. In October 2017, I attended the meeting of the North American Caribbean Region of the World Blind Union, which was held in conjunction with the annual meeting of the American Printing House for the Blind (APH). Lou Tutt was in attendance for some of the meeting and never mentioned AER’s plans for the NAC accreditation program. Since it did not get mentioned, I wondered if AER had decided to let the accreditation fade away. However, in other meetings during the APH conference, Mr. Tutt mentioned AER’s great excitement about the NAC accreditation. This raised concerns among other members of the Federation, who asked me what I knew about AER’s plans and whether or not we were asked to be involved in the accreditation council that was mentioned in Mr. Tutt’s presentations. I advised these Federation members that we were not invited to participate, that it had not even been mentioned to us directly as an organization, and that I would follow-up with AER. I am writing to you regarding the announcement that the Association for the Education and Rehabilitation of the Blind and Visually Impaired (AER) is taking responsibility for the programs previously offered by the National Accreditation Council for Blind and Low Vision Services (NAC). I am requesting a meeting with you as soon as possible to discuss the concerns of the organized blind movement regarding this unfortunate action. From my previous work with Mr. Tutt, I know that he is personally aware of the history of the problems that this accrediting entity has caused in the field. One of the early announcements from AER regarding this matter (from late August) states, “This represents an extraordinary opportunity for AER and the clients who are served by agencies committed to delivering high-quality services.” The fact that the National Federation of the Blind has not been invited to discuss this matter raises questions about the commitment to quality for the clients of agencies serving the blind under AER. For decades the National Federation of the Blind has raised concerns about the philosophy, work, and direction of NAC. This is well documented in the Braille Monitor, and I would be pleased to send you direct links if you are not yet aware of this information. A great number of organizations have come to recognize the problems with NAC and stopped their support. Even the American Foundation for the Blind, which originally sponsored NAC, pulled its support. In 2002 the president of AFB said, "This board needs to face the reality that, no matter how good NAC is or could be, it's not going to be effective, and I strongly urge its board of directors to dissolve the organization." That AER has decided to recover this brand and its practices sends a very disturbing message. More significantly, to bring the NAC brand of operation into the AER program priorities without even openly dialoguing with the organized blind movement tells blind people that their concerns are second class to the professionals. I am prepared to meet with you regarding this matter at your earliest convenience. I expect that this letter is not a surprise to you. However, I approach the conversation as if this was a genuine oversight—although a rather significant one. Although I am very interested in a meeting, I am also aware that our concerns are well known by the AER leadership. Therefore, I will assume that lack of a prompt reply suggests that AER has no time or interest in a meeting. On behalf of AER, I would like to thank you for your candid comments about NAC, and for contacting AER. It was with great consideration that AER accepted the opportunity to manage the accreditation program. We accepted with a commitment to individuals who have vision loss. Our commitment is holistic, and we are committed to ensuring that services are provided under the most appropriate conditions and generate the best results for those who are served. We recognize that there have been concerns in the past. However, we fully recognize the value of having a system in place that evaluates both operations and services. AER wants to hear from you. We want to speak with you via conference call and will schedule at a time that is convenient for you. In advance of the call, please send me your specific concerns. I would like to have a list of specific problems that you believe exist with the accreditation program. Our goal is singular, and that is to operate in solution mode. We are dedicated to having a high quality accreditation program and would value your input. We would like to schedule the conference call this week. Next week, President Catavero and I will be attending an annual conference away from both our central offices. It is worth noting that Mr. Tutt’s response suggests that AER needed me to explain to them the “specific problems” with the NAC accreditation program. This is despite the fact that our history with NAC has been well documented in the Braille Monitor. This question also presumes that the NAC accreditation program has operated with transparency—it has been impossible to find a list of accredited agencies for many years. Even more surprising is that Mr. Tutt is asking this question. He served as president of the Maryland School for the Blind for fourteen years (departing in 2004), and during that time leaders of the Federation explained to him on many occasions the problems with the NAC accreditation program. I appreciate your prompt response. I am asking Beth Braun in my office to work with you on finding a time that we can meet by telephone as you suggest. You have asked me for “a list of specific problems that you believe exist with the accreditation program.” This presumes that the plan of AER is to continue the program as it has run for decades. If this is the case, laying out concerns is a fairly easy thing to do. It strikes me that AER cannot really be considering continuing the same failing process that has existed since the 1960s, but I should not make assumptions. In other words, we cannot raise concerns until we know the details of what is being planned. The goal here was to have a dynamic conversation rather than a static response based on little to no information. My hope was that we would begin a discussion that is likely many months overdue. What are the plans for the new accreditation? Will existing agencies be permitted to roll into the new accreditation? Will the formerly published NAC standards be used, or will new ones be created? If new standards are being developed, what role will the National Federation of the Blind be invited to play in the development? Will the decision about accreditation be based on self-study or an on-site review? What role will the National Federation of the Blind have as a consumer advocate in the accreditation process? How does this accrediting body plan to fund itself? What pressure will it bring to bear on other agencies to become involved? And will it try to paint agencies negatively if they choose to be accredited by some other entity such as CARF? Will accreditation cover services for adults, services for children, guide dog schools, medically oriented programs, all of these, or a subset? Will accreditation require membership in AER or is it distinctly separate? Who is leading the accreditation process, and what partners are currently at the table? Will AER be promoting or supporting legislation to make state or federal funding contingent on its accreditation? I look forward to our meeting and to learning the answers to some, if not all, of these questions. Please let me know if the above is not sufficient to understand the concerns we have about AER’s recent announcement. On November 9, 2017, I had a call with Mr. Tutt and the AER staff member responsible for managing the accreditation process. Participating in the call with me were Anil Lewis, executive director for the Federation’s research and training programs, and Everette Bacon, a member of the Federation’s board of directors. For more than an hour, we attempted to get AER to explain to us what value they found in the NAC accreditation and what plans they had for the accreditation going forward. We received no clear answers on why AER made the decision to take over the accreditation, except that a logic model was used by the AER board to determine that the NAC accreditation program had value. We were told that they were well read on the history related to the Federation’s concerns about NAC, yet we were asked on many occasions to articulate our concerns—which are well documented in the history. We explained that the entire NAC accreditation program is flawed and should be shut down. I urged that AER explain what value they find in specifically reviving NAC rather than simply building something new from the ground up. Although it was suggested a number of times that AER is starting over, no justification was given for why they are building on the previous NAC program, and no specifics were articulated for what role the National Federation of the Blind might play in the accreditation process. We were told that it was still early in the process, and they had fully intended to reach out to us. Keep in mind that we reached out to AER on October 30, a full two months after the August 31 correspondence to the AER membership which stated, “Over the next few weeks, we will complete our assessment and make adjustments as necessary to strengthen the overall program.” At many points in the conversation, it was stated that they want to move forward and wish not to dwell on the past. I explained to them that they chose to embrace the past by making a decision to carry on the NAC accreditation program and that ignoring the history was offensive to the blind of America. To his credit, Mr. Tutt began the meeting by attempting to address some of the thirteen questions I shared with him in advance. The most important question—why continue a failing accreditation program—remains unanswered, and certain questions were left open for the future such as the possibility that AER may seek to incorporate the requirement of NAC accreditation into state or federal law. Thank you for the call today with you and Angela regarding AER’s administration of the NAC accreditation program. I appreciate your attempt to address the questions we posed in our email of Tuesday, October 31. During our call you explained that all existing NAC accredited agencies will retain their accreditation under AER. You explained that the NAC standards were being revised and that they will be vetted by a committee of experts. You further explained that the accreditation process will be voluntary, will not be tied to membership in AER, and undue pressure will not be placed on agencies that choose not to seek accreditation. You left open the possibility for future legislative action which may or may not tie funding at the state or federal level to successful NAC accreditation under AER. We advised you that AER is making a mistake by attempting to refresh the NAC accreditation program. We explained that the NAC accreditation is flawed in a number of ways, but especially in its lack of substantive engagement and direction by leaders of the National Federation of the Blind. We further emphasized that a better approach would be to start with a blank slate, building an accreditation program with clear ties to elected leaders of the blind. On a number of occasions, we asked what value the AER board found in NAC beyond what is provided by other accreditation programs. We never received a clear answer to the question except to learn that AER found value in the NAC accreditation program. A logic model was referenced, and it was suggested that an opportunity might emerge for us to learn more about the model that was used to make this decision. I have agreed that we would be willing to host a meeting in January to further discuss accreditation, assuming that AER comes prepared to explain how the organized blind movement will play a substantive role in the process and outcomes. We are prepared to engage in substantive conversations regarding accreditation in the blindness field, where it is needed, and what the measures of high performance might include. We are not prepared to talk about ways that the previous NAC accreditation can be improved. If the goal is to build something completely new or, in your terms, build the airplane while it is still on the ground, then we have the potential to make progress together, especially if you are prepared to detail the significant ways blind people will have influence in the process. If the goal is simply to remodel the plane that we have kept grounded for decades because of its inability to take blind people to new heights, I do not expect us to find more common ground in our next meeting. If you are prepared to meet in January based on my summary of the understandings of the meeting, please follow-up with Beth Braun in my office. I again wish you the happiest of holiday seasons and a happy 2018. Mr. Tutt responded saying that AER looks forward to meeting with the National Federation of the Blind in 2018. It is worth our speculating about what decisions will have already been made without us. AER began managing the NAC accreditation on July 1, 2017. They tell us they want us to be involved, but they made no effort to reach out to the Federation, and even after the first six months of AER’s administration, we will have hardly any information about their plans. History may not repeat itself, but we are smart enough to recognize a familiar rhythm. 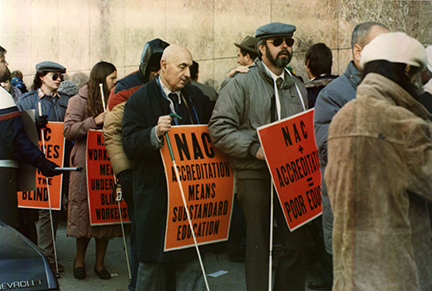 The NAC accreditation has been harmful to blind people, has not improved agencies for the blind, and has perpetuated the myth that there are two classes in the blindness field—the first-class professionals and the second-class blind. The previous generations of the Federation were effective at putting this harmful accreditation system in its place. It is now up to the fourth generation to end it once and for all. Now is the time for us to put an end to this failed idea. Let AER know that it is not acceptable to create systems for agencies for the blind without the blind. Let AER know that the consumers matter and that we urge them to close down the NAC accreditation program once and for all. Let AER know that the blind are not opposed to accreditation itself, but we are opposed to repeating all of the sad songs of the past. Send an email to nac@aerbvi.org to voice your disappointment with AER. Respectfully let them know that we share the principle “nothing about us without us” and that it is time for NAC to go. You should also make your voice heard in social media by sending a Tweet naming @AERBVI and using the hashtag #GoodbyeNAC. Make your voice heard on Facebook at https://www.facebook.com/AERBVI/. I do not know when another meeting with AER will take place. I do know that we will continue to seek ways to improve agencies for the blind by bringing an authentic consumer perspective to the leadership of those agencies. Today the National Federation of the Blind works in partnership with many outstanding professionals and agency leaders. We are successful in raising expectations, and we have worked together to create the most dynamic programs for the blind ever imagined. We will continue to seek those partnerships and to raise expectations. The existence of NAC has never stopped us, and AER’s attempt to recover a failing program will not stop us in the future.